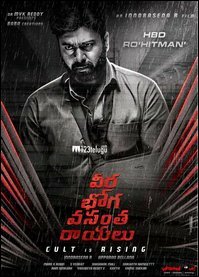 ‘Veera Bhoga Vasantha Rayulu’ which stars Nara Rohit, Sree Vishnu, and Sudheer Babu in lead roles has been in the news for quite some time now in a grand manner. The first look teaser of this experimental film will be released tomorrow and there is a good curiosity which has surrounded this film as the makers have been promoting each character quite aggressively. The film is a socio-fantasy thriller with a different theme which is new for Tollywood. Will it live to all the hype and Hungama, we need to just wait till tomorrow.